Though it may be considered the dinosaur of the digital marketing world, e-mail is still one of the most effective ways to reach your audience. But in order to be effective, it has to be done right. The term ‘email marketing’ doesn’t paint the prettiest picture. For most, it goes hand-in-hand with ‘spam’, ‘unsubscribe’ and inboxes littered with unread messages. But we want to change that. Just as the worlds of email and marketing have evolved, consumers have evolved as well. Buyers know how to opt out. All of this means that it’s no longer enough to send your average email. Consumers want to be engaged and entertained. Which means marketers must find a way to attract their attention, intrigue them enough to read further, and hook them so they won’t opt-out. Here’s why the work is worth it. There are almost too many to list, but we’ll run you through the most important aspects. First, “email is 40 times more effective at acquiring new customers than Facebook or Twitter.” Because let’s face it, even those who aren’t up to date in social media are still checking their emails. It also continues to be the most dominant communication channel, and is expected to reach 90.9% of those online by 2019. That’s huge. It means that anyone who isn’t taking advantage of or at least experimenting with email marketing is simply falling behind. And of course, there’s the fact that email is the channel that has continuously generated the highest ROI for marketers for the past ten years. It’s also the way your customers prefer to be reached. Recent studies show that “72% of people prefer to receive promotional content through email marketing, compared to just 17% who prefer social media.” And what the customer wants, the customer gets. The takeaway here is that if you aren’t yet serious about email, it’s time. We’ll show you how. What’s the worst kind of email? The one you didn’t ask for. Which is why every business needs a plan to build and maintain a quality list of subscribers. There are different ways to do this. Some simply ask for a subscription, while others offer an email series or free giveaway in exchange. But each strategy should begin with a clear expression of expectations. What can consumers expect from your emails? How often will they get them? Will they receive discounts or exclusive offers? Nomadic Matt does a great job of giving all the needed information, quickly and concisely. What can consumers expect from your emails? How often will they get them? He clearly explains what customers will get out of his emails, what types of content they will receive and finishes with a clear call-to-action (CTA). The opt-in is the first step of engagement, so keep them simple, eye-catching, and deliver them with clever copy. he opt-in is the first step of engagement, so keep them simple, eye-catching, and deliver them with clever copy. Just keep in mind, the fastest way to land in someone’s trash bin is by assuming they want your emails. Always start with their permission. A well-executed and engaging email will follow rules similar to the opt-in form. Design elements should be minimal and clean. This will ensure that your email is easy to read on all devices. And because a reported 66% of of all email in the U.S. is opened on smartphones or tablets, it’s key to make sure your templates are optimized for mobile users. That same rule applies to your copy. Make it personal by using “you” and “I” and use language that’s friendly and relatable. Add humor and tell stories, and write as if you were emailing a friend, not a sales prospect. All this should be relatively brief; after all, you don’t want your audience spending all their time on your emails. Ultimately, you want to redirect them to your website or landing page. In keeping with the simple approach, visuals should be used sparingly as well. Many viewers won’t even get the chance to see any included images, as not all email providers — Gmail and Hotmail included — display images by default. Any images you do use should appear in the top two inches of your email. Think template headers, which can be formatted to your liking and won’t interfere with readability if it doesn’t display properly. Deciding what kind of content to include in your newsletters is one of the most common roadblocks when it comes to developing an email marketing strategy. But really, it’s easier than you think. Blog posts: This is great for driving traffic back to your site. Only excerpts should be used in email — just enough to intrigue your readers — with a clear link back to your website to view the full post. New Products or Services: Emails are perfect for announcing any new additions to your business. And if you make announcements via email first, your subscribers will feel in the know and up to date. Pro tip: offering exclusive deals or discounts to subscribers is a great way to retain them. Industry News or Resources: A roundup of the latest news in your industry is another way to keep your customers informed and do the work for them. This can be an original roundup or a list of articles or resources that you find particularly relevant to your target audience. User Generated: Here’s a fun way to keep your subscribers involved, and it can be done in different ways. If you have an active social media following, run a poll and send the results out in an email. Or, use consumer pictures, comments or questions as a basis for your newsletter content. Just remember: in order to engage, your content should always be customer focused. It should solve their problems, educate or entertain them. It should always offer value, and lots of it. Your emails should be so full of exclusive content, news and killer tips that trained readers won’t think twice about opening them. A good rule of thumb is to use the 90/10 rule: Keep your content 90% educational and 10% promotional. So you have the perfect concept for an amazing email, know what you want to say and are ready to execute. But here’s the catch: none of that matters if you can’t get people to open it. So what compels people to click? All of these subjects have one thing in common: they capture your attention. They leave you with a question that can only be answered by opening the email and reading what’s inside. And it’s something you can do. Ask yourself how you can create that question with your content, and tease the reader just enough so they can’t help but click to see what’s inside. There are plenty of tools to help you do it. Free tools like SubjectLine will evaluate your subject line and score it based on email marketing best practices, while a tool like ISnotSPAM analyzes your message to protect you from Spam filters. For an even higher success rate, it takes a personal touch. Neil Patel writes that one of his secrets to success is making his emails as personable as possible (I do the same thing and highly recommend it), and suggests using your first name as your from address, rather than your company name. In fact, a study published in 2010 revealed that 68% of readers opened emails based on the from address, whereas only 26% opened based on the subject line. This has a lot to do with the human element. Rather than becoming one of the many company emails people receive on a daily basis, your email will stand out because it’s from a real person. To be especially effective, you will need to use a consistent and highly recognizable sender name. Once you’ve drawn your reader in with a killer subject line, it’s time to make good and deliver. The most important place do that is with your opening line. Not only will it serve as your hook, but it’s another portion of your email that readers will likely see before deciding whether or not to click. Most email providers will display a small portion of your email in web browsers or apps (yes, even mobile), so it’s essential that you spend some time crafting a killer opener. There are a few things to keep in mind when doing so, and at the top of the list is getting to the point. Don’t make readers wait to find out why you’re writing them. Not only does she have a clever subject line, but her opener is equally creative and gets straight to the point. And ultimately, it makes you want to read more. Once you’ve nailed the hook, it’s time to turn to the body of your email. This is where you tell your reader why your information, opinion or product is important and what value it will add to their life or business. As mentioned before, you want to keep the copy relatively short, and that applies to copy blocks as well. Keep each paragraph simple and easy to read with just a line or two of copy. Jeff Goins does a good job of this in his emails. You want to keep the copy relatively short. He keeps the copy blocks short and clean and tells you exactly what he’s advertising, and what you’ll get out of it. Most importantly, it serves as a bridge to where he really wants to send you. In this case, it’s his podcast. Which is where a clear CTA comes in. Your CTA can be a button or a line of text, just make sure it’s easily visible and the desired action unmistakable. And last but not least, don’t underestimate the power a sense of urgency can provide. Readers need a reason to click on your CTA right now, so don’t be afraid to give them one. Set deadlines and time limits on your offers or discounts to incite quick responses. 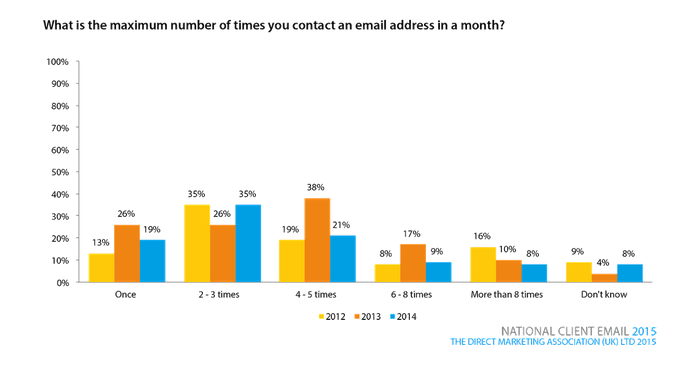 Once you’ve decided to include email in your marketing strategy, consistency is key. After all, you don’t want to ask readers to subscribe to a newsletter they’ll never see. Keeping up with them is easier than you think. Email services from providers like MailChimp and Constant Contact are designed to automate the email process by storing all your contacts and templates, so all you have to do is tweak the messaging. They’re also essential in testing the effectiveness of your emails, which we’ll cover shortly. How often you send emails will depend on the content. For example, companies like The Skimm and Groupon have new content and offers daily, so it benefits them (and their readers) to send daily newsletters. Some businesses choose to provide weekly roundups of latest industry news, so they opt for weekly emails. However, it’s all about finding the frequency that works for you, and it’s one of the elements that you’ll need to test going forward. You can do so with automated tools like MailChimp, HubSpot, etc. Once found, it’s crucial to stick to the schedule. If you tell your subscribers to expect daily, weekly or bi-weekly emails from you, make sure you deliver when promised. The success of your email marketing lies in your ability to test it. Luckily, modern tools have made it easy to do exactly that. If you send through programs like Constant Contact, HubSpot or Emma, you can easily test elements like subject lines, “from” names and timing. For example, the question of subject line length commonly arises. And the only way to find out what works best for your audience is to test the character lengths and see which draws the most clicks. The same principle applies to what time of day you should send emails or which call to action works most effectively. Marketo offers a great list of 25 elements worth testing, and recommends starting simple and testing one element at a time, and most importantly, recording and using your test results. When measuring overall success of an email, there are a few key metrics to keep in mind. First, you want to measure overall clickthroughs. See if the numbers remain consistent over time, and if they don’t, you’ll know it’s time to reevaluate your strategy. According to MailChimp, a newsletter in any industry receives an average clickthrough rate below 4%. Not exactly staggering numbers, but it helps to have a benchmark in mind when testing effectiveness. You’ll also want to pay attention to your conversion rate. Are people buying what you offer? Signing up for your events? Clicking through to your blog? This goes back to the effectiveness of your CTA, and is something that needs to be tested and tweaked frequently. Another crucial element is your spam rate, which can yet again be tracked through most email automation services. If people aren’t responding well to your emails and they are increasingly ending up in spam folders, you need to take a look at your newsletter and see what’s going wrong. Retest your subject lines and timing. Dig into your content and see if it’s personable enough and customer-focused. Email testing is an ongoing process, and should be done frequently to ensure the best results. If you’ve decided that email marketing is right for you, it’s time to dig in. Remember, a good strategy starts with quality subscribers, and continues by keeping them engaged. Your content should be clever and concise, and the value should be clear. And once you start, keep your timing consistent. Though the process may seem daunting at first, when done correctly your work will more than pay off with more engaged consumers, more traffic and ultimately, more sales.